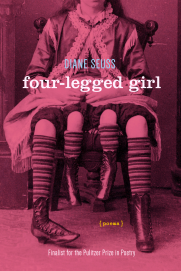 Diane Seuss’ poetry breaks down the organic matter of emotion, reducing it to it’s original earthy elements and examines facets of desire, spirituality, solitude, and freakishness under a microscope of verse and imagination. Her first book of poetry, It Blows You Hollow (1998) explores a nefarious power in being exposed as the speaker is challenged to remain transparent despite being ‘blown hollow’. The speaker in Seuss’ second collection, Wolf Lake, White Gown Blown Open (2010) which won the Juniper Prize for Poetry, lingers in the grimy filth of desire, brewing in and becoming one with the putridity she is left with. Her latest collection is a step up the swinging carnival ladder for her speaker. Four-Legged Girl (2015), finalist for the Pulitzer Prize, exposes a ferocious femininity married with a decomposing despair that is only alleviated by imagination. Seuss’ images are not of items or feelings but of the speaker’s memories of these items and feelings. These memories are described how they were experienced, but with a intonation of hindsight. It is not the experience but the memory of it that is challenging for the status quo. The speaker is a dark and lonely specimen not unlike the title character, Josephene “Myrtle” Corbin, the real four-legged girl who spent many years on display in a travelling American freak show. Ms Corbin was a dipygus meaning she had two pelvises side by side with an anatomically correct and a small leg attached to each. Seuss paints her speaker as a phantasmagoric effigy of the feminine divine in direct comparison with the four-legged girl. Both are on display and disarm their viewers by their singularities. Her fourth section free beer, is full of memories and images of decomposing beauty. In I emptied my little wishing well of it’s emptiness, the well, or the heart, was emptied by filling it with desire. The images of decay resemble a cautious inferencing, like a child gently poking a dead animal with a long stick. I’m a bee balm, a swarm at my centre. kidneys, bad teeth and bad breasts, her bad hair, her two-headed poetry”. Diane Seuss once again uses her atramentous prowess to slither under the skin of her readers. I thoroughly enjoyed being caught in the wake of the speakers evolution in four-legged girl, exposed to her interpenetration of beauty, desire, loss and suffering, all of which are on exhibit like specimens in vaudevillian side show. Four-Legged Girl is published by Gray Wolf Press, and is available here, or on Amazon.